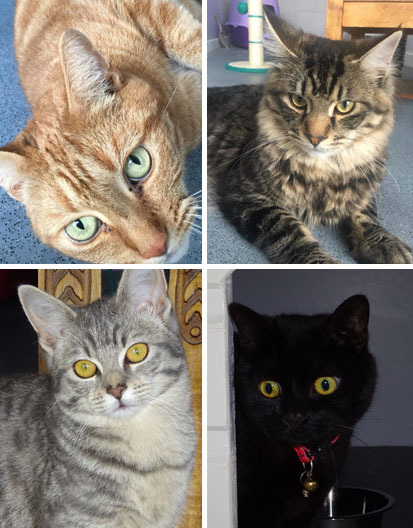 Lilac Lodge Cattery opened in May 2018 based in rural North Nottinghamshire, close to the village centre of Carlton-in-Lindrick. Within easy access to Worksop, Retford, Tickhill, Harworth, Blyth and Langold. The Cattery is a purpose built brick building. A series of French windows open out onto the extensive views of the fields, woodlands and wildlife of the area. The building is thermostatically controlled and well ventilated. The Cattery is sighted on a working farm. The house and cattery has no neighbours or businesses nearby other than the farm, so you can be reassured your cat will have a restful stay. 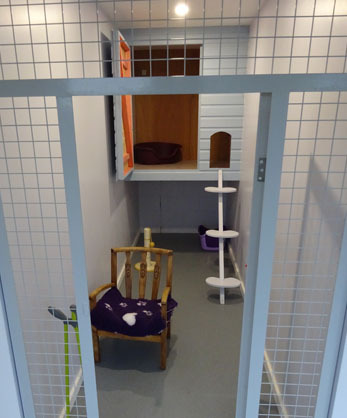 The Cattery consists of fourteen suites, all of which are family sized and adhere to the CIEH Model Licence Conditions for Cat Boarding Establishments. 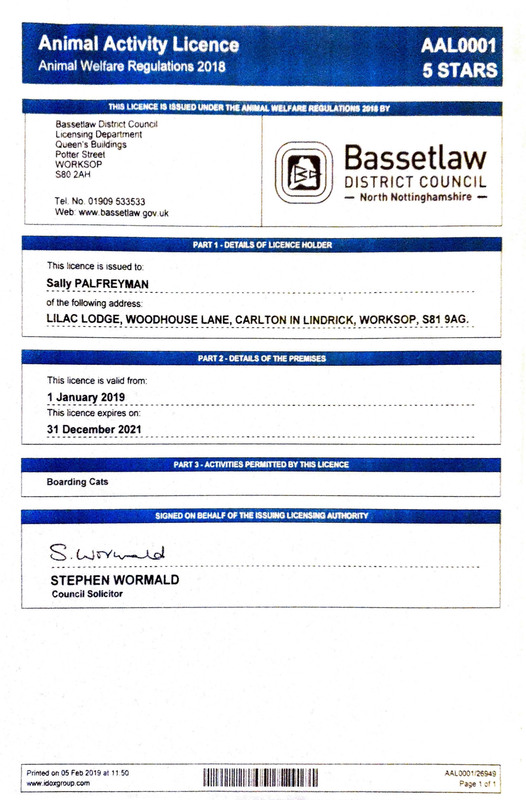 We are licensed by Bassetlaw District Council under the new Animal Activity Licensing (October 2018) regulations. This provides a generic licence for commercial pet businesses including catteries. There is a standardised criteria on various activities providing a framework of minimum standards which catteries must meet in order to gain a licence. 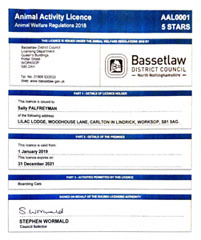 A star-rating system has been introduced and local authorities determine a cattery's star rating based on welfare standards found during an inspection and on whether that cattery is deemed low or high risk. Catteries deemed low risk and meeting higher welfare standards access the highest star ratings. We are proud to have achieved the highest standard with low risk and have been granted a five star rating. The Cattery is both owned and run by myself. I have had thirty five years’ experience working as a Registered Nurse. My aim is to provide high quality care in luxury surroundings. For enquiries, bookings or visits please feel free to contact me. I look forward to hearing from you. For further details please feel free to contact us and thank you for your interest. All the suites comply with the CIEH Model Licence Conditions and Guidance for Cat Boarding Establishments 2013 (Revised 2015, to include adherence to new Builds). The Cattery is brick built with full cavity insulation, the ceiling and floors are also insulated to a high specification. All pens have full height sneeze barriers. The intervening walls to each pen are fully washable. The cattery has the benefit of full central heating with thermostat control. The cattery is fully ventilated to ensure a fresh supply of clean air. Lilac Lodge Cattery has fourteen suites, each able to hold up to three cats. The suites are penthouse style and are fully washable. The sleeping compartments are easily accessed via a walk way. A series of five large French windows span the length of the building. The French windows have an animal safety barrier consisting of an animal standard quality mesh safety screen which comes into place when the windows are open. The cat beds will have comfy bedding to ensure a restful sleep. However you are very welcome to bring your cats own bed, this can be reassuring. High quality cat litter will be used for our residents, using either a covered or open litter tray which ever your cat prefers. At Lilac Lodge Cattery your cat will be provided with a soft comfortable bed. A choice of food. We stock a wide range of commercial cat foods, both wet and dry. If your cat is prescribed a specific diet we ask that you provide that. Your cat will have access to a cat litter tray with high quality cat litter. Daily treats are given in the afternoon. These will include Dreamies, Liver nibbles, fish and chicken tip bits, and other such kitty delights. Toys will also be provided. Lilac Lodge Cattery is brick built and is both naturally and mechnically ventilated. It is suitable for all weathers. 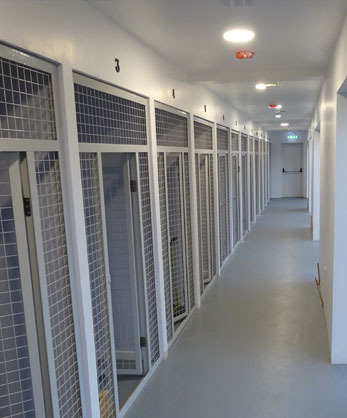 All pens are built to comply with the CIEH Model Licence Conditions for Cat Boarding Establishments. Monday – Sunday 8-10.30am - 4.30-6.00pm. Are you open Bank Holidays? We open all Bank Holidays except Christmas Day. Over Bank holiday periods we request a minimum of a 3 day stay. You can email me at – cattery@lilaclodge.co.uk, give me a call or use this sites contact form. I accept cash, cheque or bank transfer. Payment is required on admission to the cattery. Yes you can cancel a booking, I understand that life sometimes changes. However I would request that that you give seven days’ notice of the cancellation. How can I keep updated on my cat? If your cat is staying with me for a week or more I will send you a once a week update on your mobile. If I have any concerns about your cat I will keep you updated and seek the advice from my local Vets Hallcroft Vetinary Service. What happens if my cat is taken ill? I strive to provide the best quality care and safe environment I can. Should your cat become ill or injured whilst staying with me I will promptly seek advice from Hall Court Veterinary practice. Our insurance will cover any new illnesses or new injuries sustained whilst staying at Lilac Lodge. Any long term or pre-existing conditions will not be covered and you should ensure your cat has pre-existing insurance for such matters. Please be aware that cats staying at Lilac Lodge Cattery do so at the owner’s risk. Whilst I take every care to ensure I provide a safe and caring environment I cannot be held liable for accidents, illness or loss of the cats in the Cattery. If your cat appears ill on arrival to the Cattery I reserve the right to seek advice from Hallcourt Vets and decline admission if that is the advice given. It is essential that all cats are appropriately protected. My cat is very nervous. I suggest that you come along and have a look round the cattery before bringing the cat to stay. When your cat comes to stay I suggest you bring along some of their own belongings such as their bed toys and grooming aids. I use Feliway Diffuser for unsettled cats. This gives off a pheromone which cats like. I also put some Cat Nip in the cabins, dried and fresh from the garden which I find relaxes the cat. Because my cattery is small and I’m in and out all day, I can spend more time with the cats. The cats have radio 2 on throughout the day. All the cabins have the view from the French windows, so they can see the coming and goings of the day, the chickens wondering around, the wildlife and my family. My own cats are around the garden all day. I’m happy to follow any sensible requests you may have for settling your cat, as you are the person who knows your cat best of all. Please feel free to discuss the matter with me. Does my Cat require Vaccinations before staying at Lilac Lodge Cattery? Yes your cat must have an update vaccination programme, including vaccinations for Feline Enteritis, and Cat Flu. The vaccination record must accompany the cat on admission to cattery, and be left with the Cat for the duration of its stay. Any cat not attending with an appropriate vaccination record will be refused admission, it is imperative that I maintain a safe environment for all cats staying at the cattery. My Cat needs medications, can you give them? Yes I’m happy to give any prescribed medication issued by a vet. It must be in the original container, clearly labelled, with the cats name on it, and the required dosage. Please ensure you provide enough medication for duration of the cats stay. I’m also able to given prescribed treatments for diabetic cats including injections. If there is question not covered here please do not hesitate to contact me. All cats must be wormed and have been given preventive flea treatment prior to admission to the cattery, after all no one wants to take home uninvited guests! Should any cat be found to have fleas or worms whilst staying with me I will treat the infestation promptly and a charge will be added to your bill. Unfortunately I’m unable to take unneutered males in the cattery over the age of 6 months. On admission to the cattery I will ask you to complete a simple questionnaire regarding your cats basic needs, and the cats personal care. The Cattery is fully alarmed for security and fire. www.lilaclodge.co.uk COPYRIGHT © Lilac Lodge Cattery. ALL RIGHTS RESERVED.